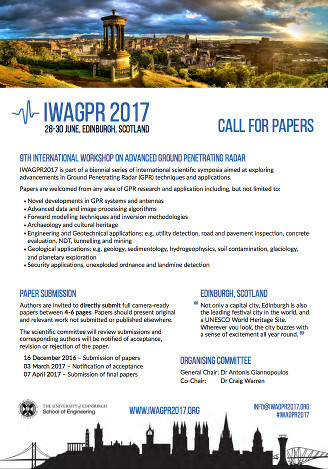 Welcome to the 9th International Workshop on Advanced Ground Penetrating Radar - IWAGPR2017 which will be held in Edinburgh, Scotland from 28-30 June 2017, and is organised by the School of Engineering at The University of Edinburgh. The three-day workshop is aimed at exploring advancements in Ground Penetrating Radar (GPR) techniques and applications. A wide range of high-quality scientific and technical information will be presented, relevant for scientists, engineers, and end-users of GPR technologies from academia and industry. There will be networking opportunities for participants to discuss and exchange ideas. Read more about the specific content of the workshop. We have uploaded photos that were taken during the conference to our Flickr account. They have been divided into albums for each day (or sometimes half day), as well as for the conference dinner. Special thanks to Francesca Ruggeri for taking the photographs and Svetlana Bricheva for helping to sort and upload them. IWAGPR2017 hosted 157 delegates from 26 different countries. We had a pre-conference workshop, followed by 3 days of conference in which 84 oral and poster presentations were made. We had a bustling exhibition area with 10 exhibitors/sponsors. Some Scottish haggis was consumed at the conference dinner as well as 420 drams of Scottish single malt whisky. The conference would not have been such a success if it were not for the support of: the School of Engineering at The University of Edinburgh; Edinburgh First conference and event management; and our local organising team. Thanks, and we look forward to seeing you at either GPR2018 in Switzerland or IWAGPR2019 in Rome. We are using the Whova App for Event Engagement & Networking. The app enables you to view the latest programme, create your own personalised agenda, find out about the exhibitors, engage with other delegates, floorplans, and much more. Get the Whova App. We are delighted to announce another Gold Sponsor - Radarteam - who will also be exhibiting at the conference. Radarteam was founded 35 years ago. They manufacture innovative GPR-technology, for shallow and very deep applications. They pioneered with Real Time Sampling, (RTS), GPR technology in 2011 with the world’s first commercially available RTS-system - the Cobra Plug-In GPR. Novel development is a triple frequency GPR with 200, 400 and 800 MHz antennas in one small single unit - Cobra CBD GPR. The wide operating band with auto blending of frequencies allows for very accurate velocity profile determination of all targets and layers using a new velocity model, the fλ-method. Both GPR-systems will be at IWAGPR 2017. Since the conference is being hosted by the School of Engineering at the University of Edinburgh - the home of the GPR simulation software gprMax - we have decided to design what we believe to be a realistic 3D GPR model which we think offers a challenge for testing GPR processing, imaging, and inversion algorithms. Before releasing information on the detailed construction and composition of this model (to be used by the GPR research community) we would like to offer the modelled data as an imaging and interpretation challenge to GPR researchers. We have scheduled a session in the IWAGPR2017 conference programme, in which we hope some results can be presented. The dataset and a full set of instructions can be found at our GitHub repository. Our exhibition space is filling up fast! We already have 8 registered exhibitors, and only 2 spaces are now left. If you wish to be an exhibitor and/or take one of our sponsor packages please do so using our registration system. The deadline for registering as an exhibitor or for one of our sponsor packages is 26.05.2017. We have another Silver Sponsor - Guideline Geo | MALÅ - who will also be exhibiting at the conference. On display in the Guideline Geo | MALÅ, you will find the newly introduced MALÅ Easy Locator Pro WideRange HDR, with the widest GPR antenna bandwidth on the market. The WideRange creates ultra-fast data acquisition for both shallow and deep utility targets — Simultaneously and all in one solution. Guideline Geo | MALÅ is offering the broadest range of GPR products in the world. Sensors, software, services and support. MALÅ delivers solutions for a wide range of applications including climate research, utility detection, road profiling, mineral exploration, archaeology, concrete investigations and much more. Welcome to visit us at IWAGPR 2017, booth 9. We have another Silver Sponsor - ImpulseRadar - who will also be exhibiting at the conference. ImpulseRadar are a start-up of experienced business professionals from the Ground Penetrating Radar (GPR) industry. Collectively, they have 130 years’ experience in this industry and have been influential in bringing to market innovative GPR solutions that have often driven paradigm shifts in the application of this effective non-destructive technology. Their GPR solutions are built on the latest Real-Time Sampling (RTS) technology platform. They are fast, offer exceptional bandwidth and dynamic range, and are modular to meet your specific needs. We have another Silver Sponsor - 3D-Radar - who will also be exhibiting at the conference. 3D-Radar has pioneered next generation 3D Ground Penetrating Radar (3D GPR) using step frequency radar technology and innovative multi channel antenna design. Their vision is to be the global leader and the preferred instrument supplier for detecting and mapping underground infrastructure. We are delighted to announce another exhibitor, Geomatrix, will be showcasing their latest products and innovations, including Utsi Electronics GPR systems during the conference. If you want to exhibit or be a sponsor, please take a look at our sponsors & exhibitors packages. Geomatrix offers one of the largest short term hire pool of near surface Geophysical Instrumentation in Europe, offering products such as GPR, magnetometers, seismographs, gamma ray spectrometers, EM sounding and profiling instruments Gravity meters and resistivity meters. They are able to provide guidance in planning and implementing a geophysical survey, as well as resolving technical queries regarding instrumentation design or how to adapt a system to meet a particular application. We have another Silver Sponsor - Transient Technologies - who will also be exhibiting at the conference. Transient Technologies is an innovative privately owned company based in Kyiv, Ukraine. Since 1998 they have been engaged in scientific research into Ground Penetrating Radars technology. The utilization of a modern approach and the latest techniques are essential to their product development. They manufacture VIY®-series GPR and related equipment. We have 3 fantastic keynote speakers - David DANIELS, Evert SLOB, and Xavier DEROBERT - who will present at the conference. Our speakers are all eminent in the field of GPR and a have diverse range of experience between them, so we look forward to some interesting and stimulating talks that delegates can engage with. Take a look at our draft programme, and read brief biographies of the keynote speakers. We have a published a draft programme (subject to change) providing a general overview of events for the conference. A detailed programme showing which papers will be in each session will be published in the coming weeks. We are delighted to announce that EuroGPR are a Silver Sponsor and will be exhibiting at the conference. EuroGPR are an association made up of users and manufacturers of GPR equipment, intent on raising standards within the GPR industry and looking out for the rights of our members, giving them voice at a pan-European level on matters such as licensing, health and safety and market access. Detailed guidance for submitting your final camera-ready paper is available from our authors section. Please note the deadline for submitting your final camera-ready paper is 19.05.2017. Please remember that presenting authors must be registered for the conference. We are delighted to announce another exhibitor, IDS GeoRadar, will be showcasing their latest products and innovations during the conference. If you want to exhibit or be a sponsor, please take a look at our sponsors & exhibitors packages. IDS GeoRadar provides products and solutions for geophysical, mining, civil engineering and security applications. Founded in 1980 as part of IDS Ingegneria dei Sistemi in Pisa, Italy, the company was recently acquired by Hexagon. Great to see such a healthy number of submitted papers, thanks to the authors for all their hard work. We are about to begin the review process, and as a consequence of extending the paper submission deadline we have also extended the deadlines for notification of paper acceptance (now 31.03.2017) and final paper submission (now 28.04.2017). We are delighted to announce that Sensors & Software is our first Gold Sponsor and will be exhibiting at the conference. We have extended the deadline for paper submission by one month until 16 January 2017. Registration for the conference is now open. The system allows you to register as delegate, student delegate, or exhibitor, and to choose any sponsorship packages. Please take advantage of our accommodation offers and early-bird rates. We are delighted that the Institute of Electrical and Electronics Engineers (IEEE) Geoscience and Remote Sensing Society (GRSS) will be a technical sponsor of IWAGPR2017. As with previous IWAGPR conferences the proceeding of the conference will be published by the IEEE through IEEExplore. We are announcing our call for papers for the workshop. Authors are invited to directly submit full papers between 4-6 pages by 16 December 2016. All the details of topics and important deadlines can be found in our call for papers document. Please share our call for papers document with interested parties. We are pleased to present our Scientific Committee for the workshop. It is composed of 39 international experts from industry and academia that have backgrounds spanning the many diverse areas of GPR research and usage. Our thanks to everyone who agreed to be part of the committee! Launch of an initial holding webpage and Twitter feed for IWAGPR2017. At this stage providing some very basic information of the dates and location of the conference. Much more to follow!